Digital signage is a term used to describe the display of up to the minute information on electronic devices such as plasma screens, LCD panels, and projectors. Other terms such as narrowcasting, electronic billboards, digital messaging and place-based media are also used to describe this communication tool. Information can be common or unique among any number of display devices and information from multiple sources can be displayed simultaneously. 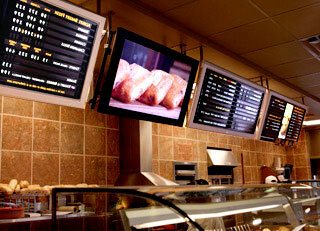 Auditoriums, hotels, and transportation venues are common venues for digital signage. 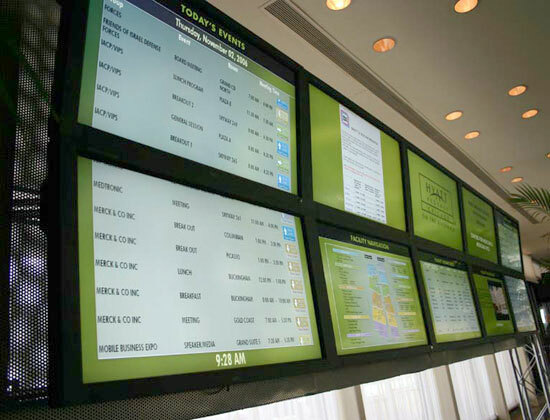 Providing customers with current schedules, way finding directions or real time information such as news, weather, sports and advertising can be informative to patrons and visitors. Digital Signage is often used in lobbies to communicate with visitors and customers, or employee areas for human resources and corporate communications. For timely advertising and impulse decision influencing at the point of purchase, digital signage provides a more compelling message. Many retailers and advertisers are seeing the advantages of in-store digital signage over traditional print and television buys. They are reaching their target audience and viewers are captive  they can't change the channel. Retailers can dynamically change the content being displayed based on factors like inventory levels, margins, time of day, POS data etc.